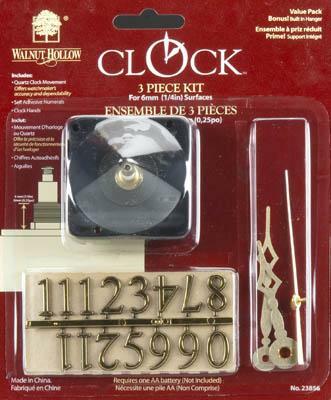 This is the 3 Piece Clock Kit for 1/4" Surfaces by Walnut Hollow. Retail $10.00 SAVE 23% ! Suitable for repair or restoration of all kinds of clocks, or create your own. The quartz clock movements offer watchmakers accuracy and dependability. Instructions located on the back of the packaging. Due to small parts that could cause a choking hazard please keep away from children 3 years of age and younger.